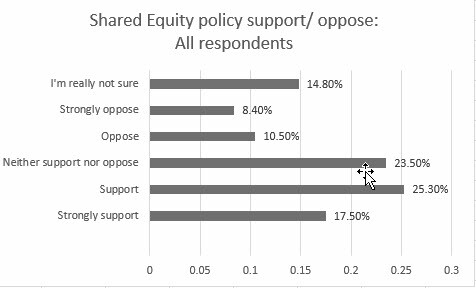 More New Zealanders support than oppose the idea of a shared equity scheme to help people buy their first homes. 41% would support a scheme under which the Government and others might put money in as a deposit for first home buyers who are buying homes costing between $500,000 and $600,000. Buyers would pay less up front and repay the deposit over time. It is argued this would allow more people to buy their first home. 19% oppose the idea, according to a survey conducted by Horizon Research. 24% are neutral and 15% not sure. Strong support is at 25%, strong opposition 8%. 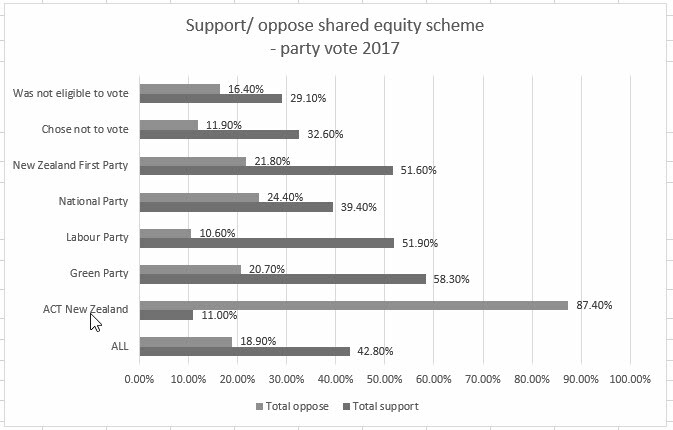 The idea has more support than opposition among those who voted at the last general election for the Labour, National, New Zealand First and Green parties. ACT 2017 voters are the only ones opposed (87% against, 11% for). 40% of National voters support the idea, 24% oppose. Among Labour voters, 52% support, 11% oppose; Green 58% support, 21% oppose; New Zealand First 52% support, 22% oppose.